With wild colors and fun patterns, Beastie Brushes are sure to brighten up your grooming routine. Champion Hill Brush Company makes hundreds of different patterns in dozens of different colors. Don't be fooled by cheap imitations, these brushes are the real deal. Well filled with good quality medium fiber bristles, Beastie Brushes are perfect for general grooming and are built to last! 6 1/4'' plastic back with medium polypropylene bristles. Assorted colors, please let us choose. 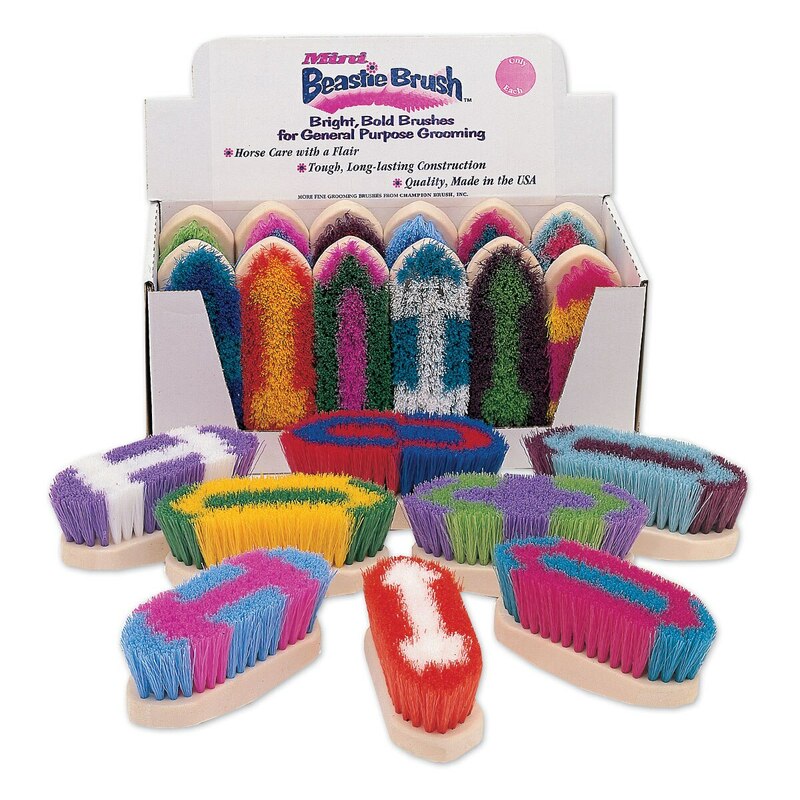 Mini Beastie Medium Brush is rated 4.6 out of 5 by 17. Rated 5 out of 5 by Diesel10 from Would like to choose the color Super cute brush is my favorite size but since it was a gift for my son (from Santa) for the pony Santa brought, it would have been great to not get purple. But he didn't mind and it works great for the ponys crazy coat for now until clipping for mini show season. It will still be nice for quick mane clean ups at home. Rated 5 out of 5 by Liz S from Great for legs I bought the brush for cleaning dry mud off legs, it is the correct stiffness and size. I have used it daily for two months, holding up well. Rated 5 out of 5 by Peeps from The perfect brush Nice size, fun colors, and perfect stiffness/softness. This is my go-to brush for grooming. I even have one at home for the dogs (used regularly for over 5 years). Fits my hand perfectly and is very durable. Easy to wash/clean. Price is right too! Rated 2 out of 5 by chowmom from Not Crazy About this brush I bought this brush recently and in less than a month using it on one horse who is body clipped, it already seems to be wearing out. Not a good value for the money. Rated 5 out of 5 by Pasture Ornaments from Love Them! Great Product. Easy to hold. Horses love them. Because of various colors and patterns- easy to recognize which one belongs to which horse. Highly recommend and will purchase again. Rated 5 out of 5 by RissaKid15 from I love it❤️ I bought this a while age and my horse loves it a lovely color too.I love smartpak because they have nice quality with nice value.Definatly buy it! Rated 5 out of 5 by poorhorselover from Just the right size Great little brush--not too stiff, not too soft, and just the right size for my small hands. Rated 5 out of 5 by RedStryker from Best Brush My rescue dog had been terribly mistreated and was afraid of being brushed. I used a regular handled brush for short hair dogs, and could never give him a complete brushing because of his fear. When I received this Mini Beastie Brush I gave it a try and my dog loved it! It's soft, but really gets the dust and excess hair. Perfect size for my 80 pound dog. I use it with Miracle Groom in between baths. Couldn't be happier - and it's so cute!